I’ve never been much of a Who fan. In high school, many of my friends were very much into them but in the battle of the 70s bands, I gravitated much more toward Pink Floyd. I do enjoy the Who’s Next album (it’s the only one I own) but I can’t say I reach for it very often. I’ve never gotten into Quadrophenia or Tommy. In short, they are pretty much a non-entity to me. But… I love ‘The Kids are Alright.’ I consider it one of the great songs of its era. I think a big part of the reason is that it doesn’t really sound like other Who songs — it owes much more to The Beatles. This entry was posted in song of the day and tagged The Kids are Alright, The Who. 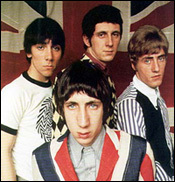 I actually think of The Who as more of a 60’s band. I too have never gotten into them all that much, although I appreciate Townsend’s songwriting talent. This particular song has very little real identification with the Who sound. It’s almost like the Spinal tap songs where they are showing the 60’s commerical phase of their career (Gimme Some Money, Listen to the Flower People). Of the Who songs I do like, I count My Generation, Baba O’Reilly (Teenage Wasteland), Pinball Wizard and a number of other tracks off the very impressive Tommy album, Some of their bigger hits like Won’t Get Fooled Again and Love Reign On Me kinda annoy me for some reason. Their 80’s output was decent enough with You Better You bet and Another Tricky Day, which I would see repeatedly during the heydays of MTV. Still, other than Tommy, which I owned at one time on vinyl, I have never felt the need to own a Who album.